I’m always delighted to hear from readers. Over the years I’ve had emails and letters from male and female Kyddites ranging from children/teenagers to octogenarians! Some have special connections with the sea; others enjoy engaging with the colourful characters of the Georgian period. Many tell me they just like an engrossing, page-turning historical novel… Whatever the reasons for reading my books I plan quite a few more titles to come! Following on from the charming Cuban Grandmother in December, the January Reader of the Month is Ethan Morley-Olabarria. 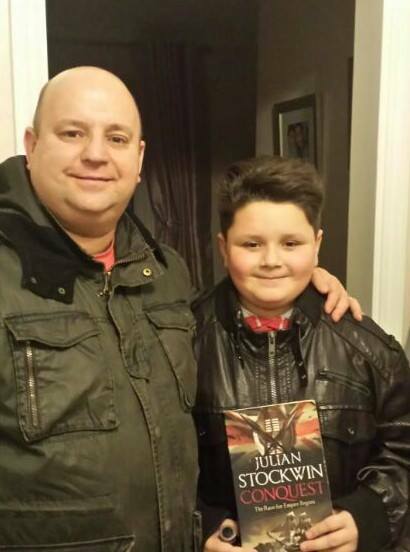 Ethan, eleven, recently started secondary school and is getting high grades in his English assessments – which his father Andy puts down to the Kydd books! Andy first picked up a Kydd when he was in the British Army stationed out in Namibia and told me the tales gave him an escape from the stresses of army life. He says he was hooked from day one and Tom Kydd has since travelled all around the world with him. He started sharing his love of the series with Ethan when his son was just five by reading the stories to him. ‘As he was so young I would have to explain quite a lot of the context but he soon learnt to follow the tales with excitement.’ Now they read the books to each other! A lovely father and son tradition. Ethan says: ‘I’ve learnt a lot of history about the Navy. I have also learnt to read out loud and to be confident when reading.’ His favourite book is Conquest, which is the first book he read from cover to cover without his father helping. Ethan says he would like to go to sea when he grows up – but not in the Navy; he plans to become a marine biologist. Excellent choice for Reader of the Month Julian. Here’s wishing you and yours a very Happy, Healthy and Prosperous New Year.